Basis great inputs and discussions from Amrik Heyer, FSD Kenya, Stephen Mwaura former Head of Payments, Central Bank of Kenya, Uma Shankar Paliwal, Former Executive Director, RBI, Dennis Njau, Head of Channels, Kenya Commercial Bank, Gang Chai, Payment Policy Manager, Central Bank of Nigeria and Johnah Nzioki from Eclectics. In a recent workshop organised by MicroSave’s The Helix Institute, leading DFS industry players including providers, regulators, aggregators, and technology providers, came together to deliberate on innovative ways to address the key challenges facing agent networks. They divided into three groups to look at the key issues in the context of: 1. policy and regulation; 2. strategy and market evolution; 3. operations. Digital financial services (DFS), premised on digital and mobile solutions, have changed the financial sector landscape, bringing increased efficiency, convenience, and consumer options. 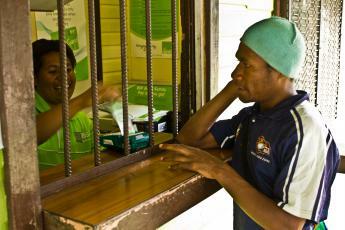 It has increased access to financial services to a hitherto financially excluded population. As per GSMA’s 2016 State of the Industry Report-Decade Edition, there are 500 million mobile money registered accounts globally, of which 118 million are active (30-days). Active (30-days) mobile money agents stood at 2.3 million. Historically opening a bank account in many markets has been a challenge due to Know Your Customer (KYC) requirements. Unbanked groups often suffer disproportionately in their ability to offer proof of identify, based around birth certificates and passports, and proof of address based around utility bill payments. Globally over a billion (17.7 per cent) of the world’s population remain without access to official KYC. The World Bank ID4D 2017 Global dataset, the graph below, provides the estimated population lacking identification. People without KYC documentation are excluded from access to formal financial services, including savings accounts, loans, remittances, insurance, pensions etc. However, it goes deeper, and often they are unable to receive benefits from the government digitally, including social security, basic health care, primary and secondary education. Lack of identification is further a hindrance to legal migration to other countries, and to receive remittances internationally through formal channels. The business case for institutions offering digital financial services is driven mainly by volume. This means providers must increase their customer base, and must focus on on-boarding large numbers of new customers which is much easier if there are simple and effective ways to satisfy KYC requirements. Conversely the existence of formal KYC enables efficient on-boarding of customers can a) facilitate mechanisms which may not require a branch b) allow harmonisation of government databases for government to person payments, and c) enable transaction mechanisms which do not require signatures, and can facilitate access to financial services carefully tailored for different groups of people. The World Bank ID4D 2016 dataset (see graph below) indicates the progress of national identity card systems of different countries and regions as per the World Bank Group's Identification for Development initiative. Few countries have no national identity usually countries in conflict. Paper national identification documents are gradually being replaced by digital forms of identification. Electronic ID is a physical form of identification which can be used for online or offline identification purposes, this could be in the form of a photocard with an embedded chip containing information. A biometric electronic ID adds a biometric form of identification usually based on fingerprints. In most markets subscribing for mobile money is easier than opening a bank account. Differentiated KYC applies - with higher levels of KYC required for opening an account due to the nature of banking products and higher transactional value and volumes. This is a key reason for exponential mobile money growth compared to agent banking in many markets. Countries without national identification have sometimes introduced simplified KYC regulations to increase financial inclusion. This includes restrictions on transaction values (deposit/ withdrawal/ transfers) to mitigate anti money laundering (AML) risks. In these cases - if a customer wants to upgrade from a simplified KYC account then the customer needs to provide full KYC to their financial institution. Pradhan Mantri Jan-Dhan Yojana (PMJDY), India's National Mission for Financial Inclusion ensures access to financial services through simplified KYC. In almost 3 years, 290 million accounts have been opened under the scheme, with 60% of the accounts in rural and semi-urban areas. $9.9 billion savings are held in these accounts, giving an average balance of $34. Challenges in the rollout of national identification forced the Nigerian banking sector to provide all banked customers with a Bank Verification Number (BVN). The BVN enrolment is the process of capturing a customer's details, including fingerprint and facial image, after which a BVN is generated. The BVN is expected to minimize the incidence of fraud and money laundering in the financial system, as well as enhance financial inclusion. In Uganda prior to the national identity a financial identity card was introduced and linked to a credit reference bureau. After signing up an initial 900,000 customers, 150,000 customers were being added annually. The Uganda financial identity card was not sufficient, nor was it designed to drive financial inclusion. Mobile money with simplified KYC is an effective way to on-board large numbers of customers. However, facilitating mobile phone based access to full banking services is in high demand in mature DFS markets. Equity Bank in Kenya has seen transactions conducted at agents are more than double those at the bank branch and ATMs – and that self-initiated transactions conducted on customers’ mobile devices are four times those made at agents. By end 2015, an unprecedented 65 million people around the world were forcefully displaced by war, conflict, or natural disaster. Refugees and displaced population face great challenges in obtaining formal identity and proof of residence, and often fail to meet KYC requirements. A few countries, including Egypt, Zambia and Uganda, have allowed refugees to open mobile wallets using Government attestation card/ID/ UN refugee registration cards issued by UNHCR to increase financial inclusion. However, regulators reported concerns that providing identity to refugees needed very careful application due to the application of Anti Money Laundering and Combating the Financing of Terrorism provisions. Evolving from paper-based identity to digital identity is a challenging for many governments. It requires huge capital investment to create a national database, and removing duplication records from multiple existing databases so that there is a single identification number per individual. Access to national identification databases varies from country to country; but to drive financial inclusion digital access should be available to regulated financial institutions at no fee, or a very low fee. Government and private institutions in Kenya are progressing with an Integrated Population Registration System (IPRS), a central database to verify the identity of a citizen and residents. Commercial banks, telecommunications companies and other institutions are digitally linked to the National Population Register of the IPRS, and use this information for efficient customer on-boarding. Given that on-boarding customers is easier with a digital identification, competition can be facilitated by removing barriers, not only to on-boarding but also to movement of customers. So, for example, using the Aadhaar identity combined with a digital locker containing customer documents, the India stack is designed to enable customers to receive offers from multiple financial institutions. Where governments have allowed public and private institutions to access the digital ID database, it is very important to decide what information should be shared with different institutions: the full information about the individual, including full KYC details; or just allow for verification in order to protect the privacy of citizens. For example, in India, the government is not limiting Aadhaar as a mean of identification for efficient and targeted delivery of government subsidies and services. In addition, private agencies like financial institutions or telecom companies can use Aadhaar for the purpose of electronic KYC replacing the physical POI / POA documents and also authentication of a transactions based on biometrics attached with Aadhaar. In other words, in the federated structure, the demographic data including biometrics reside with the government agency and other agencies, including private ones, are allowed to fetch the required demographic data for KYC and biometric match based confirmation for authentication of transaction on real time basis. In conclusion: Digital identity and KYC, including tiered KYC are vital components in cost effectively and rapidly onboarding large numbers of unbanked and underbanked people to functioning mobile money accounts and bank accounts. With large populations with a digital account, and with digital identity accessed by government, the financial and payment sectors, rapid evolution in government to person payments, merchant payments, and technology enabled financial services should take place worldwide.